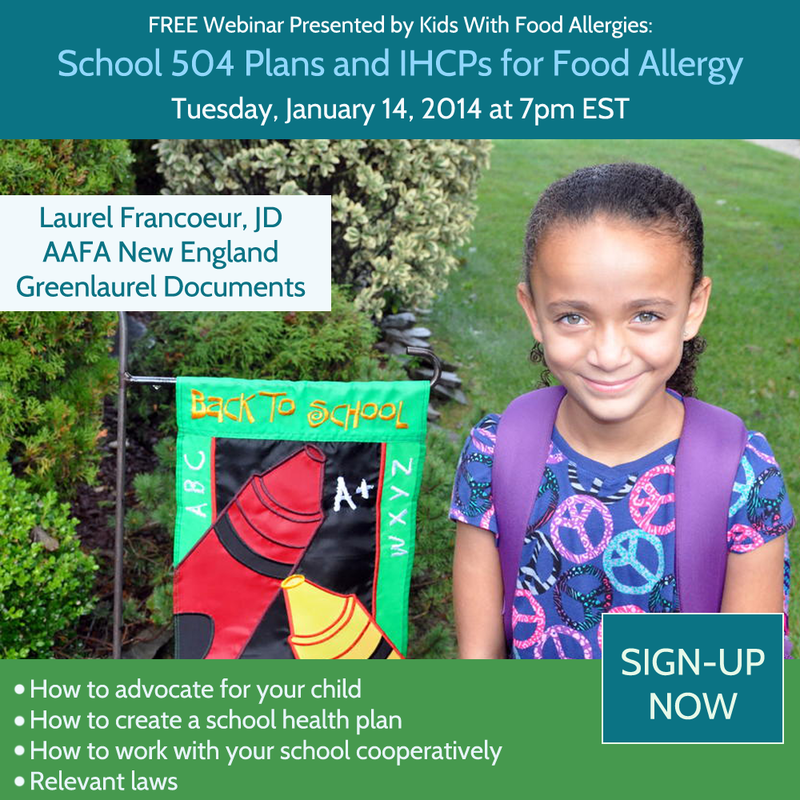 Do You Need a 504 Plan or Individualized Health Care Plan for Your Child with Food Allergies? Register to reserve your online seat -- HURRY, SPACE IS LIMITED! Join us online at a webinar to learn about school health care plans that identify the types of responsibilities, training and services required to keep your child's environment safe and how to respond to an emergency, should one arise. This presentation will review how you can advocate for your child's safety in the school setting by becoming familiar with two plans used for food allergic children: Individualized Healthcare Plans (IHCP) and 504 plans. This webinar will include a discussion of the relevant laws and how to work with your child's school cooperatively and proactively to create a comprehensive school health care plan. Register even if you cannot attend so that you can receive the video and resources after the event. Laurel Francoeur, Esq. graduated from Massachusetts Institute of Technology with a Bachelor of Science degree in Political Science and a minor in Philosophy. She is also a graduate of Suffolk Law School and has been a practicing lawyer since 1996. Laurel is a support group leader for the Asthma and Allergy Foundation of America, New England Chapter, and has served on its board of directors. She has served on the FAI (Food Allergy Initiative) Steering Committee, and has appeared on ABC News talking about her experiences as a parent of a food allergic child. Laurel has drafted legislation in Massachusetts which now gives students easier access to life-saving medication, and she has also testified at the state and federal level about food allergy issues. Laurel is the author of “How to Advocate for Your Food Allergic Child: A Manual for Getting What Your Child Needs at School” and "Flying With Food Allergies: What You Need To Know." She is also co-founder of Greenlaurel Documents, an online source for food allergy tools including automated health care plans and restaurant cards. All speakers for Kids With Food Allergies webinars are doing so without compensation. We appreciate their sharing their time, expertise and insights with us. All webinars presented by Kids With Food Allergies are recorded and archived, so if you cannot attend, please register anyway so we can email you a link to the video to watch at your convenience. This webinar is made possible through a sponsorship by Mylan Specialty. A watch and win giveaway will include three copies of Laurel Francouer's e-book, How to Advocate for Your Food Allergic Child: A Manual for Getting What Your Child Needs at School. Here is a blog post that Lynda did regarding plans. And here is the followup from the webinar w/ the video recording of the presentation plus tons of other resources. Shoot, I missed signing up. Is there still a way to find out about recorded webinars? I run a FB group for mom's who have kids with food allergies and I alway love to share the KWFA resources in our group. We record all webinars for later viewing. If you sign up for the webinar, you will get an email letting you know when the recording is ready. I teach at that time. Is there a way to order the e-book or see/hear the webinar at another time? Reminder: our webinar on 504 plans and IHCPs is tomorrow (Tuesday)!